It appears pent-up demand for an iPad version of Microsoft's productivity suite has propelled all three Office for iPad apps —Microsoft Word for iPad, Microsoft Excel for iPad and Microsoft PowerPoint for iPad —to the top of Apple's iOS App Store for iPad. Microsoft introduced the apps on Thursday. 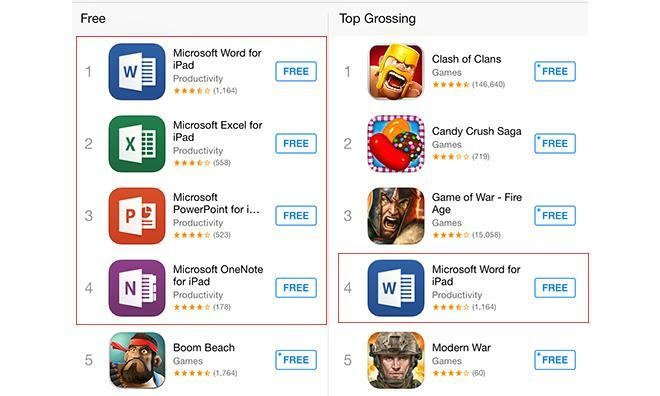 As seen in the above image, the three Microsoft apps top the list for free iPad downloads, with Word in first, Excel in second and PowerPoint in third. The redesigned OneNote, released alongside Office for iPad yesterday, takes the fourth place spot. Microsoft's new iPad apps are of the so-called "freemium" variety, meaning they require in-app purchases to unlock certain features. In the case of Office for iPad, free features include document viewing, but users need to have an Office 365 subscription to make edits. Existing subscription holders can sign in immediately, though Microsoft also built in a subscription purchasing mechanism in each Office app. As with any other software distributed through the iOS App Store, Microsoft Office is subject to Apple's usual 30 percent cut of any new in-app purchases, in this case subscriptions. Current Office 365 pricing stands at $99 per year or $9.99 per month. Microsoft's latest iPad apps are also making an appearance on the App Store's Top Grossing apps chart, with the most in-app subscription buys coming from Word, which is currently sitting in the number four spot, while Excel and PowerPoint follow in 11th and 26th, respectively.